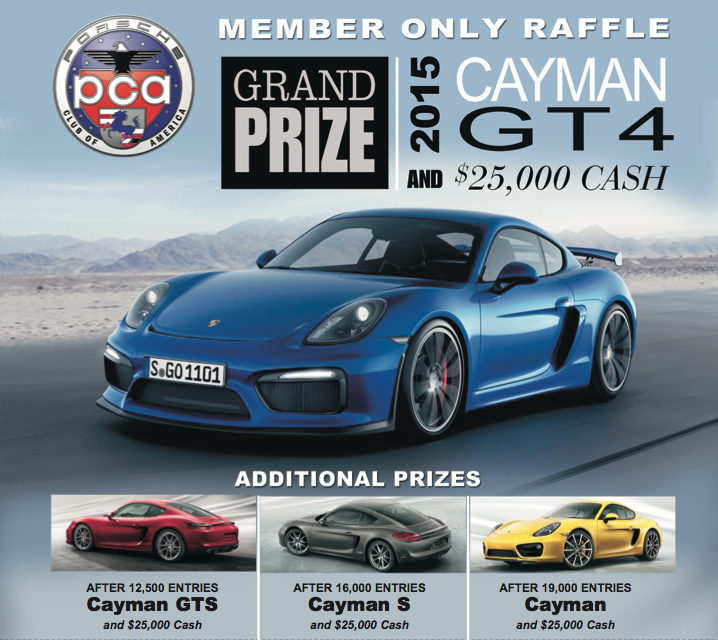 Spring 2015 Member Only Raffle: Cayman GT4 grand prize! The Spring Member Only Raffle is open with a stunning grand prize: a Cayman GT4, the most performance-oriented model in the Cayman lineup stuffed with a 385-horsepower 3.8-liter flat six and GT3-derived suspension. If raffle entries pass 12,500, a Cayman GTS will be added to the mix — plus a Cayman S after 16,000 and a Cayman should members submit more than 19,000 entries! Of course, each prize includes $25,000 cash. The raffle is open to members through May 31, so be sure to purchase entries here (must be logged in). For official raffle rules, click here.